Dental Implants are usually very successful and give you beautiful result with a better chewing ability. But the success rates your dental implants depend on your dentist, type of implant and office technology. 1. Is your Implant Dentist a Board-Certified Specialists or Just a General Dentist? Implant dentistry involves surgical procedures with significant skills, expertise, and knowledge. An American Board-Certified Specialist is required to take additional years of high standard trainings to learn proper surgical skills and receive Diplomate Degree. As frightening as it may seem, many general dentists today are taking few days or weeks of classes on implants, working on plastic model then starting on patients. At Aria Dental, our dental implants are placed with top Orange County’s implant specialists or American Board- Certified Periodontists who have many years of continuing education and experience. They are a member of American Academy of Implant Dentistry. 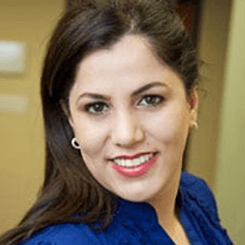 Since we have a team of dentist and specialists in our office, your treatment is often reviewed with multiple doctors to provide the best treatment options. 2. Does Your Implant Dentist Have Extensive Experience? When choosing a dentist for your dental implant, you want to be sure that they are specializing in dental implants. As most dentists offer a range of treatments, it’s important to check that the dentist regularly places dental implants to ensure you are getting the best possible treatment. As a rule of thumb, you will want to make sure that dentist your considering has been practicing for at least 10 years. At Aria Dental, our implants are placed with implant specialists or American Board- Certified Periodontists who have more than 20 years of experience with 1000s of successful results. 3. Do They Have 3D CT-Scan in Their Office for Precise Implant Placement & A Comprehensive Evaluation? A Comprehensive evaluation requires both a medical and dental assessment to make sure there is no medical conditions that contraindicate with dental implants or raise the risk of failure. Since traditional X-rays and Panoramic X-rays provides only 2D imaging, 3D CT-Scan is required for a detailed analysis of jaw bone volume as well as assessment of the teeth, gum, bite, aesthetic factors. In addition, the 3D CT-Scan imaging of your jaw bone and teeth is very important for accurately viewing vital tissues such as nerves and arteries to prevent any damage during procedure. However, most dentist would not have this technology within their practice. At Aria Dental, we follow ‘best practice’ procedures by providing the latest and hi-tech dental implant services such as in-house 3D Cone Beam CT-Scan. On regular basis, our skilled dentists utilize high definition 3D CT-Scan to acquire high quality images to precisely plan the placement of dental implants for achieving the highest success rate. 4. Does Dental Office Have a Dedicated Sterilization Suite? As with all dental treatments, sterilization system is a must. That’s why it’s reassuring to know whether the implant clinic you choose has a dedicated staff member and room for sterilization, which will ensure that every possible measure has been taken to prevent infection, keeping you safe, and reducing risk of implant failure. At Aria dental, our microsurgical implants are placed in a highly advanced sterile environment with NO cross-contaminations. 5. Do They Have a New State-of-The-Art Facility with the Latest Technology to Diagnose & Treat? Advanced technologies and the latest science not only offer faster diagnosis and treatment, but also ensure a more effective treatment option. At Aria Dental, we are committed to use the latest and most advanced materials and equipment to maximize the effectiveness of your treatment, improve the standards of patients’ dental care, and enhance the result of our patients’ experience. Some of the cutting-edge technologies and treatments that we offer are: 3D Cone Beam CT-Scan, Digital X-rays, Platelet Rich Plasma (Stem Cell Dentistry), and Growth Factors. Digital Impression by iTero Element, Sedation Dentistry, and All-on-4 Implants. You will know you’ve chosen wisely when you walk into Aria Dental. 6. What Type of Dental Implants They Are Being Used? There are hundreds of implant systems. It is very important to use only implants from the most reputable implant companies with a consistent, historically proven track record of successful osseointegration and results that you can depend on. At Aria Dental, we only place FDA approved implants from most researched implant companies with the highest quality and the most advanced Implants. We offer both Titanium or Metal-Free Zirconium Implants. 7. Where Is the Laboratory Work Being Manufactured? Many patients are unaware of where their crowns are being made, with many being constructed overseas. However, you should remember a crown is going into your body; therefore, it is advisable to receive your crowns from laboratory that are under control of USA Health Department. We do not send your crown to other countries. At Aria Dental, we create your crown in one of the best local USA Lab from your unique high precision and fast Digital Tooth Impression by iTero Element without using gooey impression materials. 8. Do They Offer Flexible & Affordable Payment Options? Like many medical and dental offices, when you receive dental services, you are typically required to pay in full. This requirement can cause you to think twice about being proactive with your dental health. At Aria Dental, we believe your oral health comes first and has the highest priority. We make our dental implant very affordable, accept most insurances, and gives you flexible payment options such as Care Credit, Lending Club, Simple Pay (which allows for 0% financing and no credit checks). In addition, we offer in-house dental saving plan and membership. QUALITY & TYPE OF DENTAL IMPLANTS: There are hundreds different implant systems from different companies and countries. There are many low-quality dental implants in the market that not only last enough, but also fail and cause more complications. 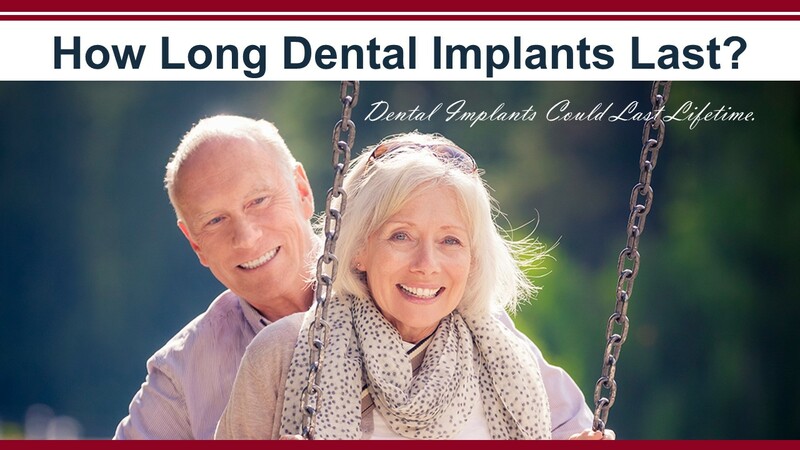 You need to choose a dentist who only places dental implants with the highest quality from the most reputable implant companies and consistent proven track record of successful results. At Aria Dental in Mission Viejo, we place FDA approved implants from most researched implant companies with the highest quality and the most advanced Implants. They include Nobel Biocare (USA), Zimmer Dental (USA), and Straumann (SWZ). PATIENT’S LIFESTYLE AND OVERALL DENTAL HYGIENE: Dental Implants provide long-term, indefinite sustainability when properly maintained with adequate brushing and flossing, assuming the patient receives regular dental check-ups. Like natural teeth, dental implants are as sturdy and susceptible to decay and need to be maintained through regular home-care hygiene. In server cases of poor hygiene, dental implants could fail due to periodontal (gum) disease. Feel free to contact Aria dental at (949) 364 - 9600 to learn more about dental implants and proper care techniques. LOCATION OF MISSING TOOTH: Tooth Location is also factor in the expected longevity of dental implant. The molar teeth (back teeth) can fail more quickly than implants in the front of the mouth due to receiving more strain from chewing. PREEXITING MEDICAL CONDITIONS, DISEASE AND IMPLANT MISUSE: Dental implants could last lifetime, but health issues could cause an implant to fail prematurely. People who suffer from a preexisting medical condition such as diabetes and cancer have a higher risk of dental implant failure. If you have questions about dental implants, our implant specialists can tell you more about dental implant options. What Are the Main Symptoms and Signs of Late and Early Dental Implant Failure? Despite the many benefits of dental implants, they have potential to fail. Severe pain or discomfort. 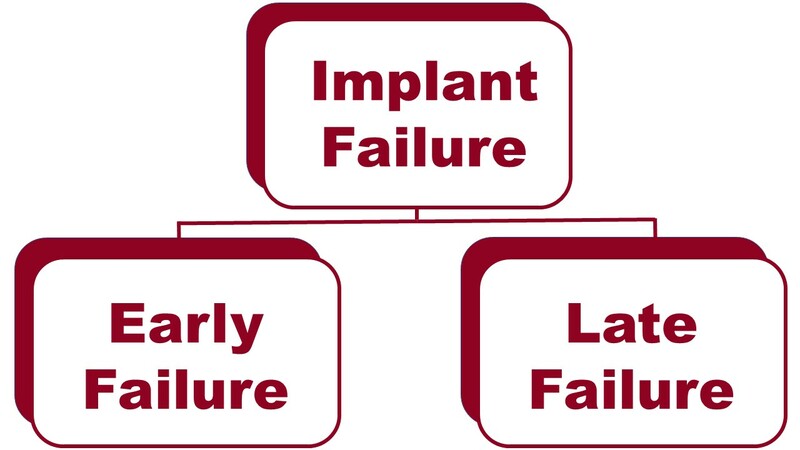 The Main Reasons for Early and Late Dental Implant Failure? Early failure of dental implants happens during the implant integration with the jaw bone with 3-4 months after procedure. POOR BLOOD SUPPLY – Poor blood supply could be from a blood disease, a blood clot in the body, or an autoimmune. MEDICATIONS – Some medications such as bisphosphonate that is used to treat Osteoporosis can get in the way of the success of dental implants. POOR HEALTH – success rate of dental implants can be reduced due to lack of improper care of your teeth, gums, and entire body. INFECTIONS – Infections can destroy the chance of implants to integrate successfully. One of the most common infections related to implant failure is Perio-implantitis, which is a type of gum disease, mainly due to autoimmune disease, smoking, or bad oral hygiene. REJECTION of FOREIGN BODY – As a body could reject any organ transparent, the patient’s body can reject the implant. ALLERGIC REACTION – Most dental implants are made of Titanium alloy and could have some traces of nickels, which cause an allergic inflammatory reaction in some patients. This reaction can be a tingling or burning feeling. OVERLOADING – In a typical implant procedure, the implant procedures are completed in two stages: one is insertion of implant; the second stage is the placing of abutment and crown. If these two stages are done one right after the other one to shorten the treatment time, the procedure can lead to overloading, which is excessive force or pressure of the abutment and crown on implant. This overloading can ultimately lead to dental implant failure. The dental implant failure is considered long-term if it happens after 1-10 after procedure. There are several factors that can contribute to a late dental implant failure. SMOKING which increase the risk of experiencing a failed implant between 6.5% t0 20%, according the Journal of Internationa Society of Preventive & Community Dentistry. BRUXISM (Teeth Grinding or Clenching) which make it difficult for implants to integrate with your jaw bone. POOR DENTAL HYGIENE which will cause gum disease and infections. HEAD & NECK RADIATION – Patient with head, neck, and mouth radiation to treat cancer in these areas are prone to dental implants failure. LACK OF BONE – If the patients don’t have sufficient bone to support the implant, the bacteria can get in there and infect the site, which will slowly eat away the implant cement and ultimately cause the implant to fail. MECHANCIAL DAMAGES – the implants can be damaged by an injury to the mouth and teeth, which will ultimately cause the implant to fail if it’s left untreated.